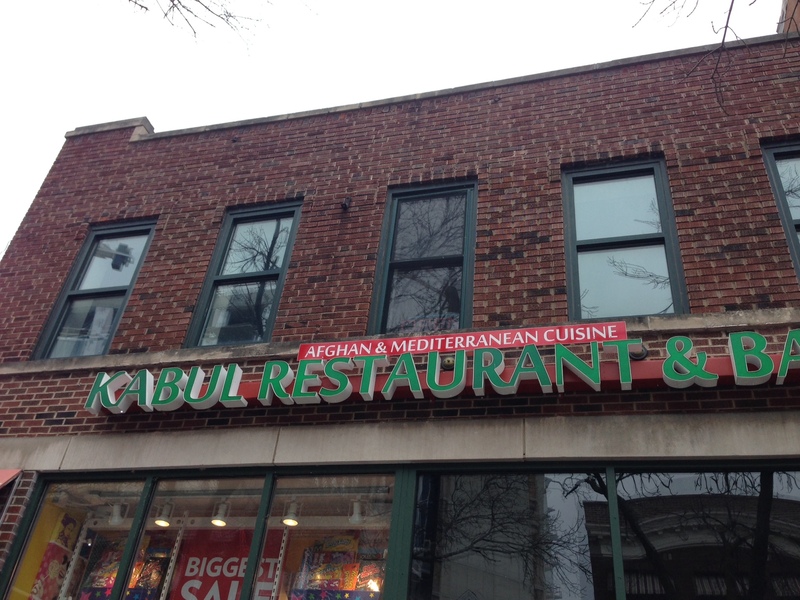 Kabul has been a staple on State Street for years, serving up mediterranean and Aghani food with unique flavors and one- of-a-kind dishes. They had to move out of their old location last year because of a massive construction project, and their loyal following was a little nervous about whether or not they would reopen. Several months after their original location (which I thought was always a little loud, crowded and had too much stuff on the walls) was torn down, they opened up less than a block away in a second-floor space that used to be part of Gino’s. 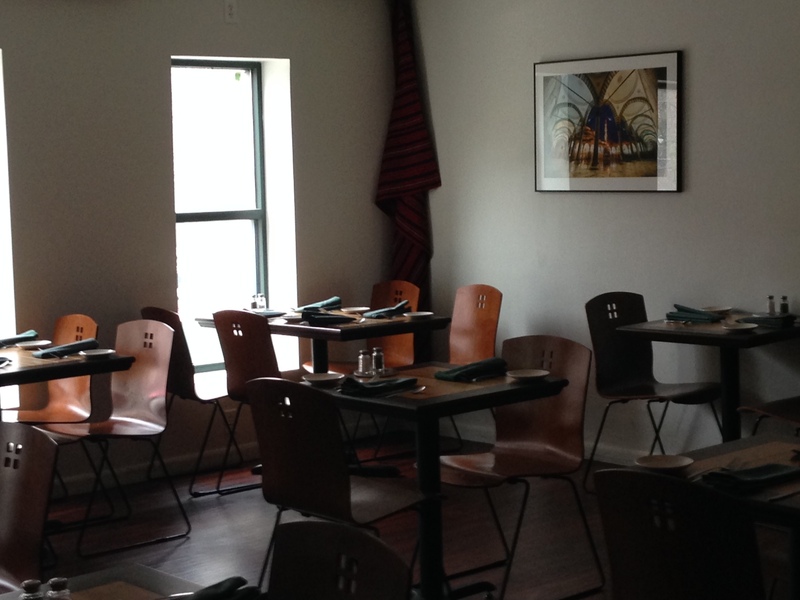 The menu stayed mostly the same with some updates, but the dining room is much different. 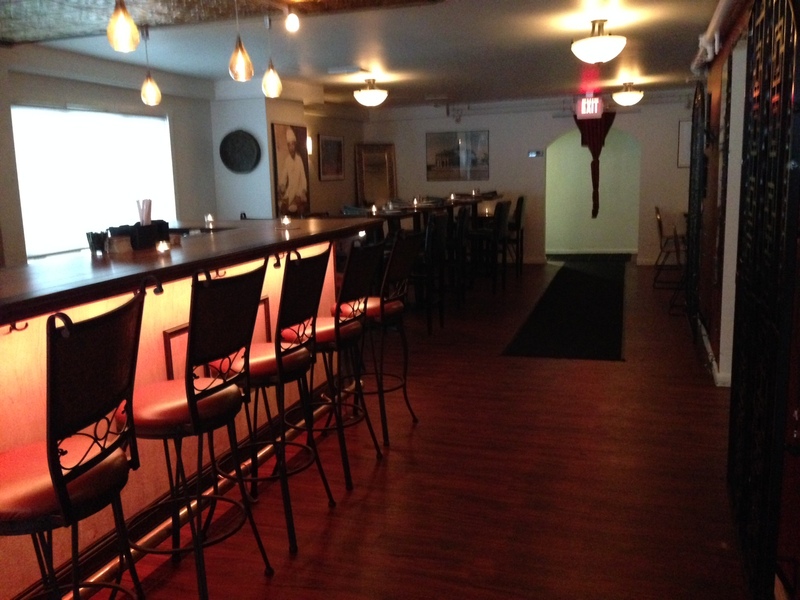 Kabul’s new second-floor location features a bar and great overlooking State Street. I know it’s harder to run a business on the second floor, but I have always loved them (think Sunroom Cafe and Wasabi!). They feel calmer and are great for people watching. 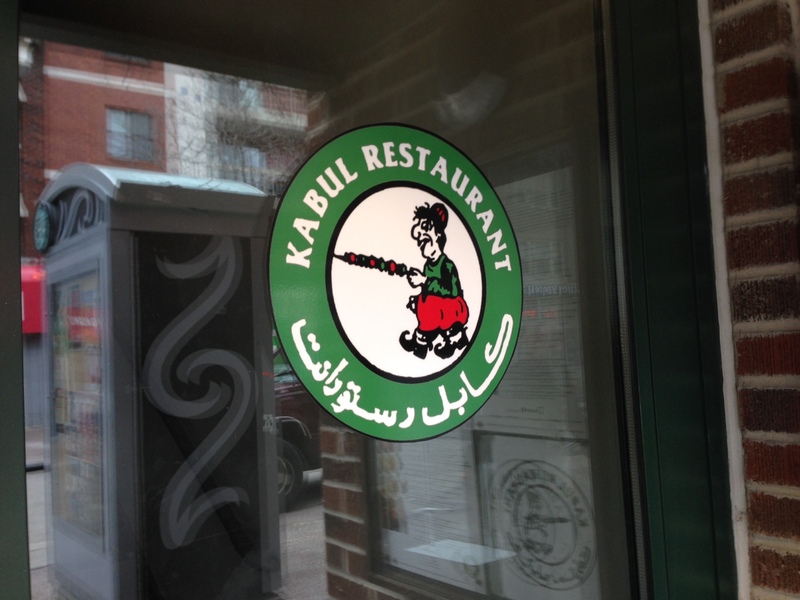 Kabul’s new location is just that…calmer, less cluttered and has great people-watching windows. Michelle Li and I got to try a bunch of different dishes featured on both their lunch and dinner menus. We started with the mashawa soup that has lamb, chicken, beans and dill in it. 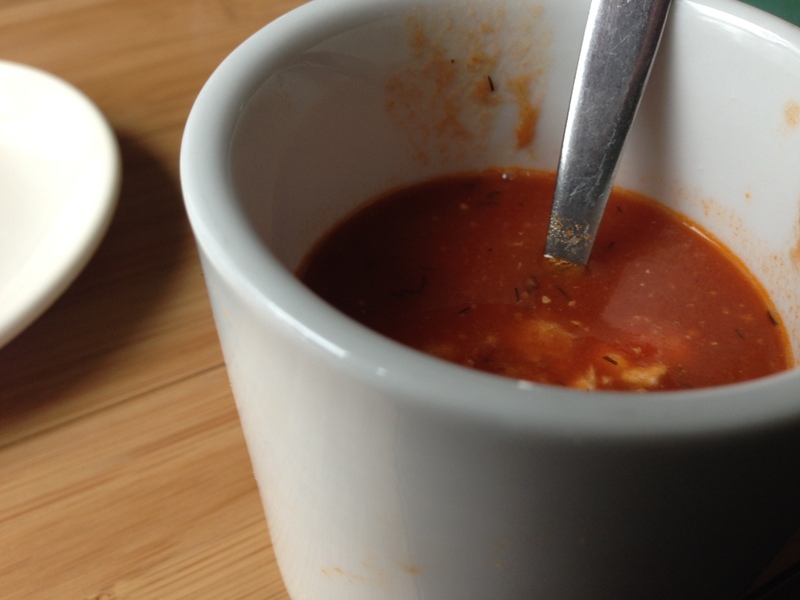 The tomato-based soup was hearty, flavorful and had just a tiny kick of spice. 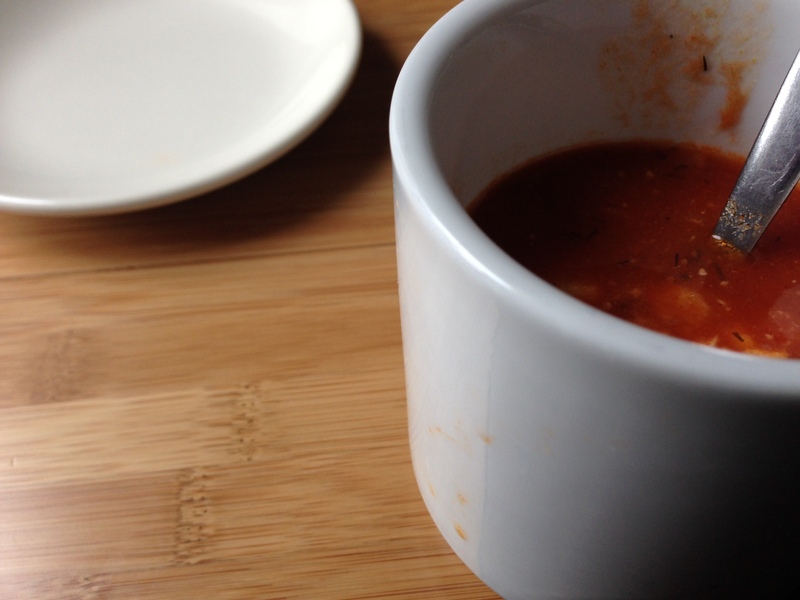 The flavors were rich and balanced — it tasted like a professional version of the lentil and bean soup I try to make at home! The house salad was pretty typical, but the housemade cucumber, mint, apple yogurt dressing made it phenomenal. I’m not usually a yogurt dressing fan, but this one was light, refreshing and had a little sweetness. It was also really great with their Afghan bread. I don’t think I would have ever gotten that dressing if I had a choice, but I’m glad we got to try it because it was so tasty and unique. Ours came with some sauteed raisins and carrots on top. The dinning room manager told us the carrots and raisins are usually served on top of rice, but they wanted us to try them. They were perfectly cooked, but I don’t love raisins so I didn’t love them on top of my salad. Along with the bread we got to try two chutneys. The cilantro, jalapeno one was not my favorite (the soap thing again), but if you like cilantro it would probably be a good choice. The tomato, pimento one tasted less tomatoey than I was expecting. It had a unique, tangy flavor that I enjoyed, but I preferred dipping the bread in the cucumber, yogurt dressing! 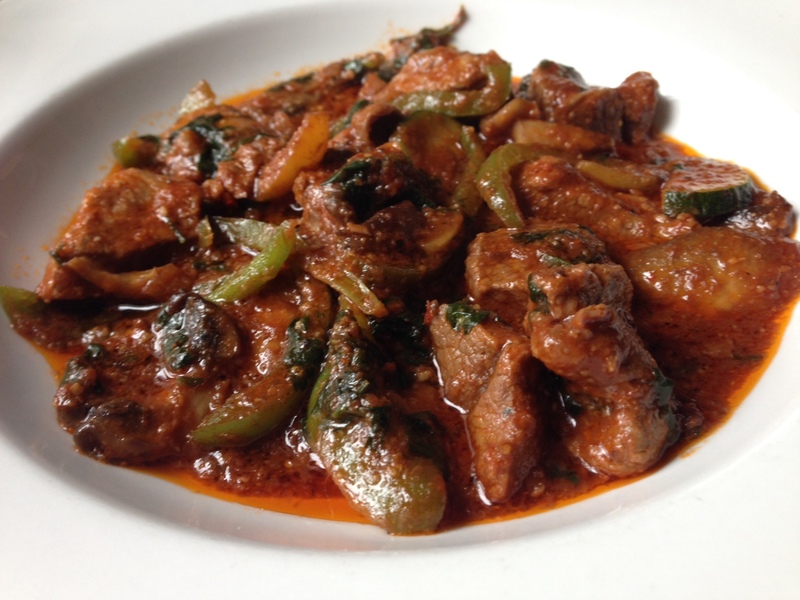 Our first dish, which is actually listed as an appetizer on the dinner menu, was ashak. It is a steamed dumpling filled with scallions and topped with a meat or veggie sauce and yogurt. We got a meat and veggie combo. I’m not sure what made this dish so special, but it was by far my favorite. The dumplings were flatter than what I was expecting and had an egg-noodle quality to them. 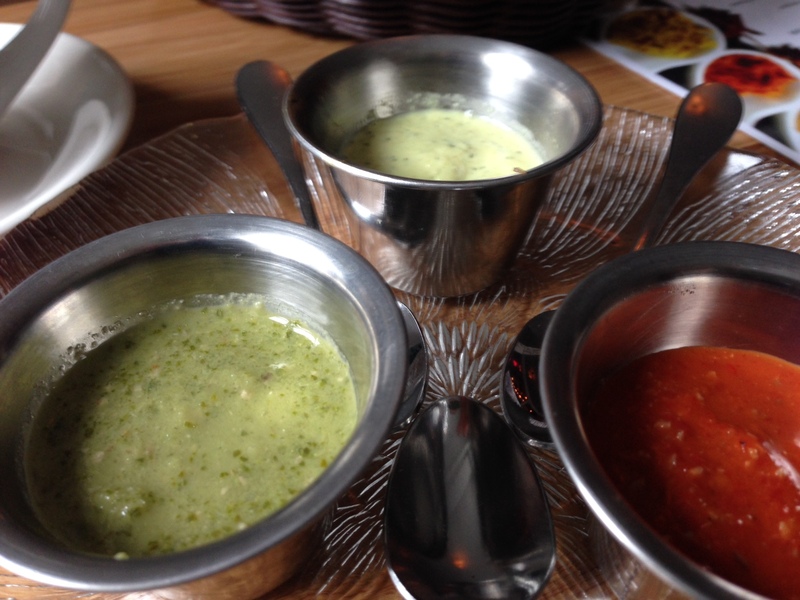 They were the perfect base for the flavorful veggie and meat sauces. The dish isn’t initially spicy, but a great flavorful spice hits once you’ve had a couple bites. 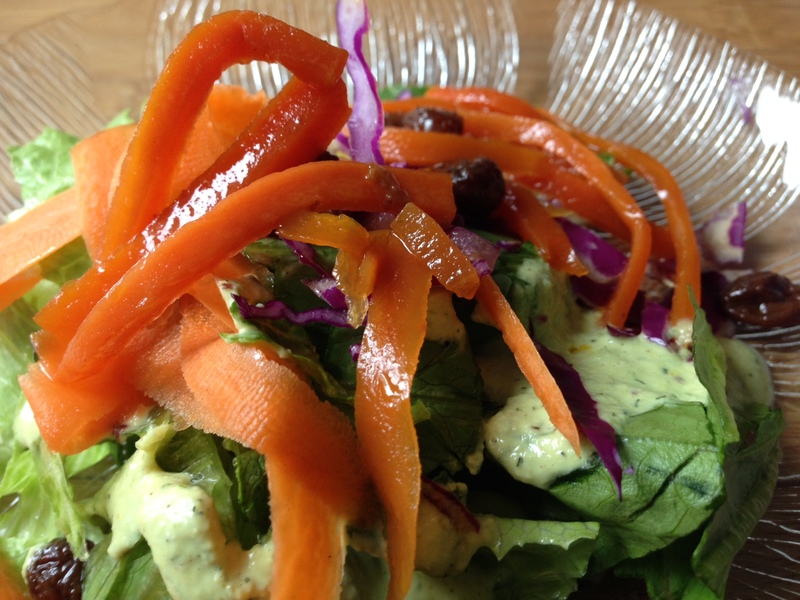 The yogurt on top adds a fresh, cool taste and texture to the dish. Ashak has the consistency of chili with noodles, but the flavors are so much more developed and savory…it felt like an Afghani comfort food! We also got to try the owner’s lamb special. 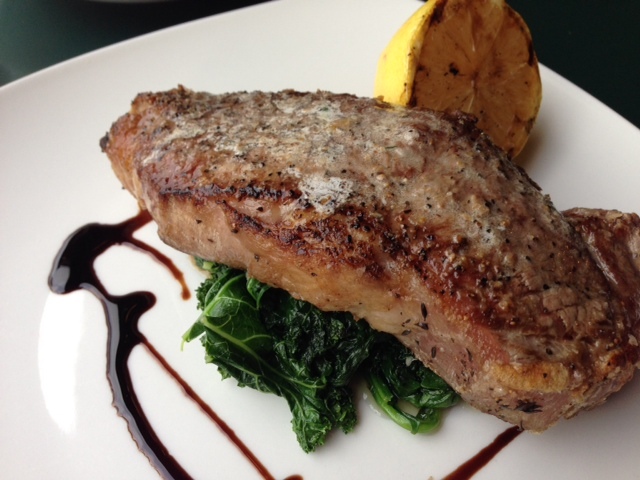 I don’t have much info on what was in the lamb special (you know…it’s secret! ), but it was very tasty. I don’t love lamb, but this lamb was perfectly cooked and was smothered in this really flavorful sauce that I’m guessing was tomato based. There were a ton of spices in the sauce that blended well, but it wasn’t hot spicey. We also got to try the two types of stuffed chicken they serve at Kabul. The first one was the stuffed chicken with cream sauce. The basil cream sauce with pepper and mushrooms had an unexpected, but extremely appreciated tang to it. Michelle and I could have licked the plate of this one clean. 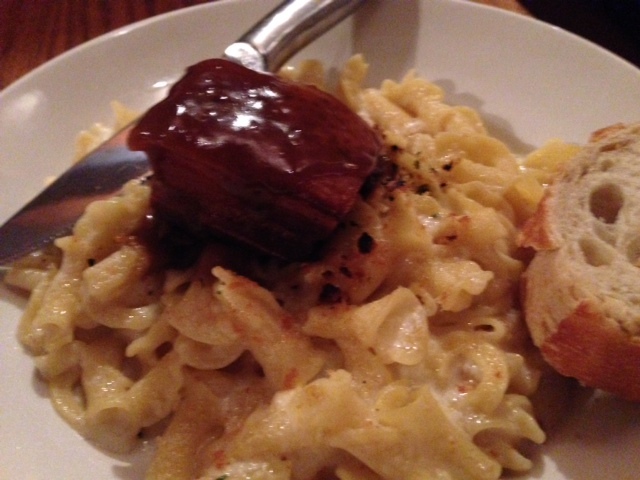 The sauce was just so unexpectedly light and flavorful for a mushroom cream sauce. 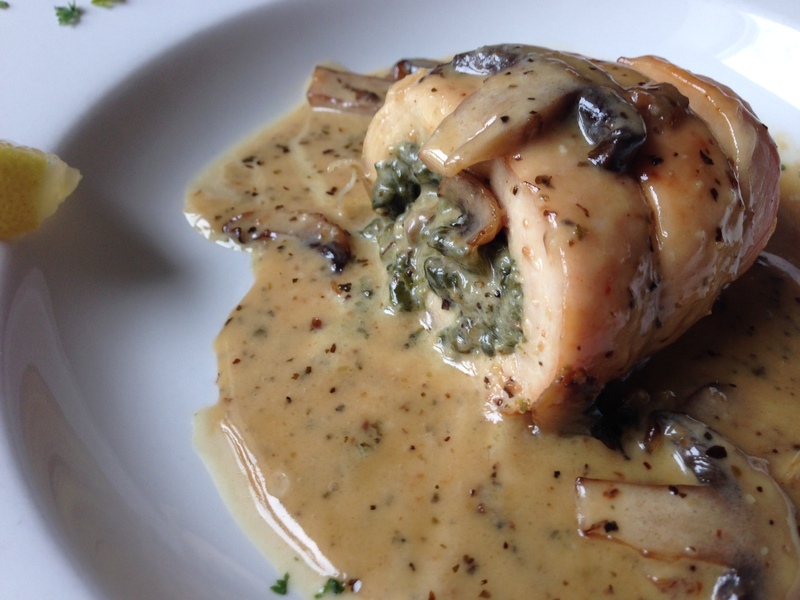 The chicken was stuffed with spinach, feta cheese and mushrooms and was a perfect vessel for the amazing sauce. 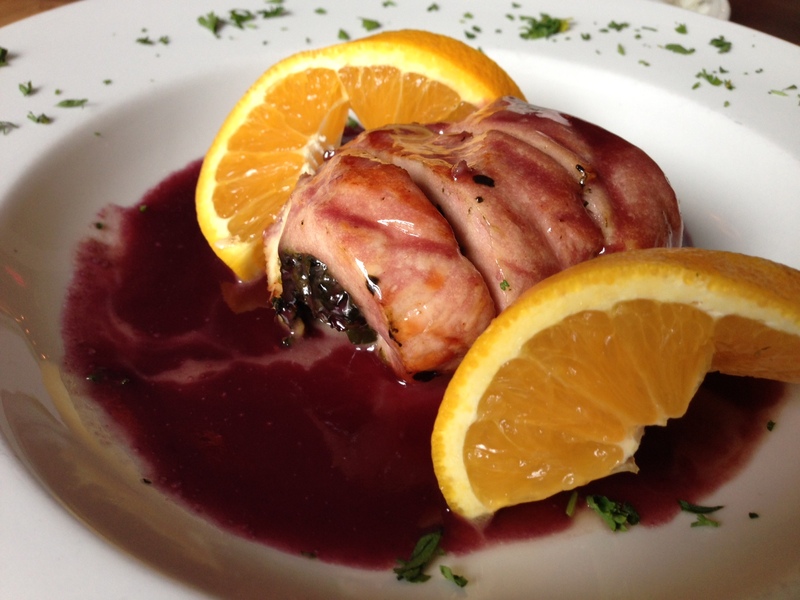 The second one was stuffed with the same ingredients, but came with a raspberry burgundy reduction sauce on top. 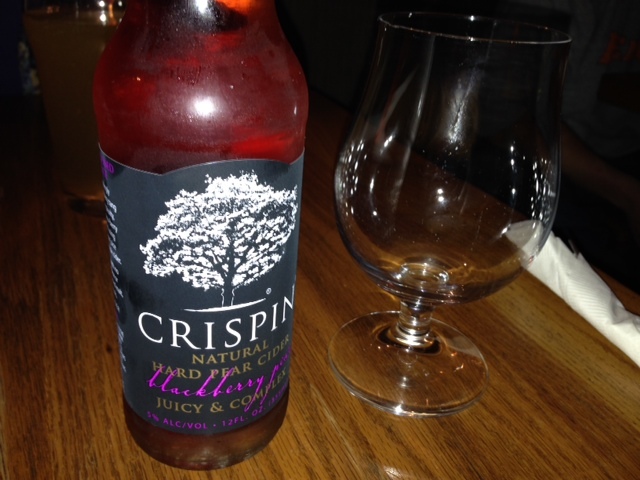 I don’t love sweet fruit sauces with my savory entrees, so this one was definitely not my favorite. But if you like sweeter sauces, you would probably love this lighter version of the stuffed chicken. 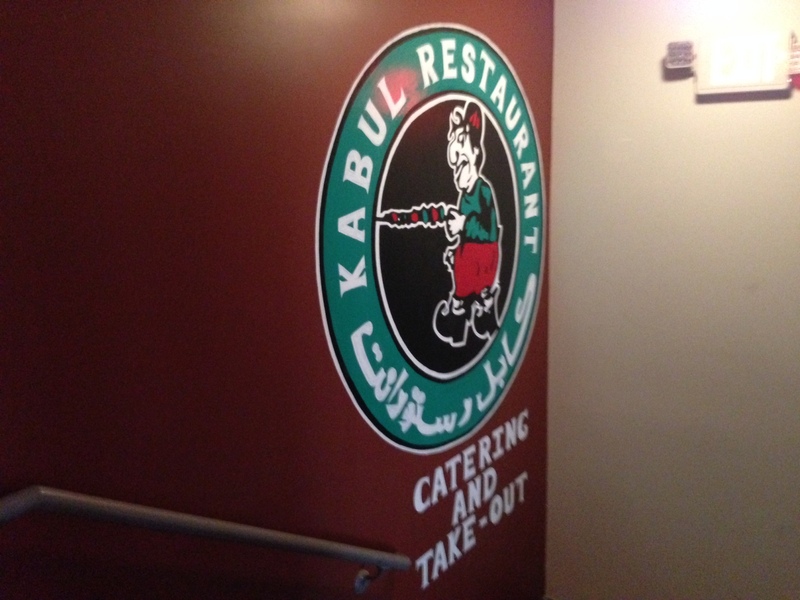 FOOD NOTES: Don’t forget about Kabul in it’s new second-floor location. 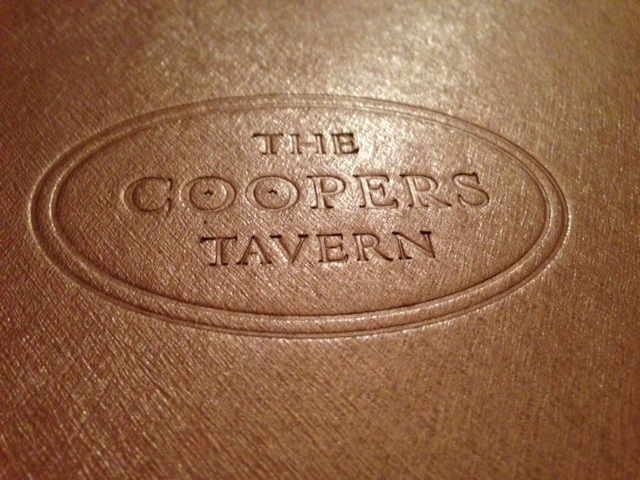 The new location boasts a full bar, a simple, welcoming atmosphere, and great windows for people watching! The traditional soup, bread and chutneys are great ways to start the meal, but make sure your Kabul experience includes the extremely unique and hearty ashak dish. 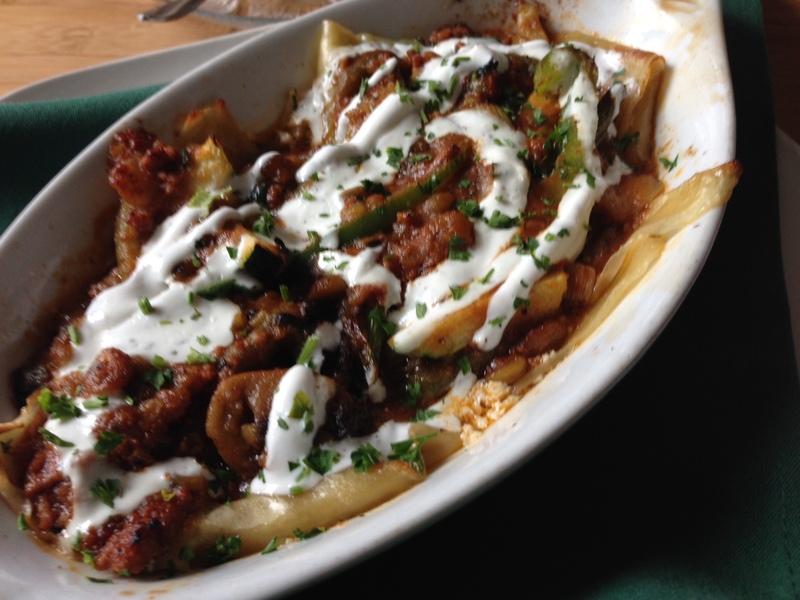 Ashak could be an appetizer split by the table or an entire entree for one person. The stuffed chicken topped with the best and most uniquely flavored cream sauce I’ve ever had is also a must. There are countless options for a unique dining experience at upscale pub-style restaurants in downtown Madison, but there’s not very many similar options outside the isthmus. 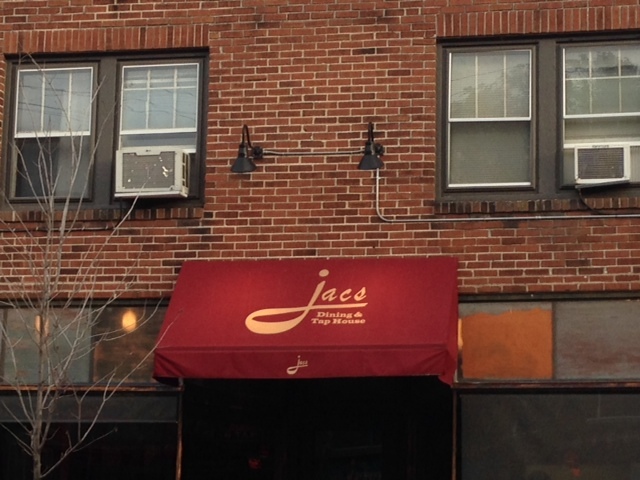 Jacs on Monroe Street is a newish addition to the near west side that is similar to what you would expect from upscale pubs on the Capitol Square. Jacs offers its own unique menu options along with dishes very similar to Brasserie V, like mussels or steak with frites. The small brick building is sandwiched in between Michael’s Frozen Custard and a strip mall with a coffee stop, cat supply store and Indian restaurant. The best feature of the restaurant is its huge pair of front windows that bring in light to the dark dining room and allow for ample people watching. We showed up a bit before the dinner rush and got one of the coveted window seats. By 5:15 the entire place was packed with groups of people, couples and families. 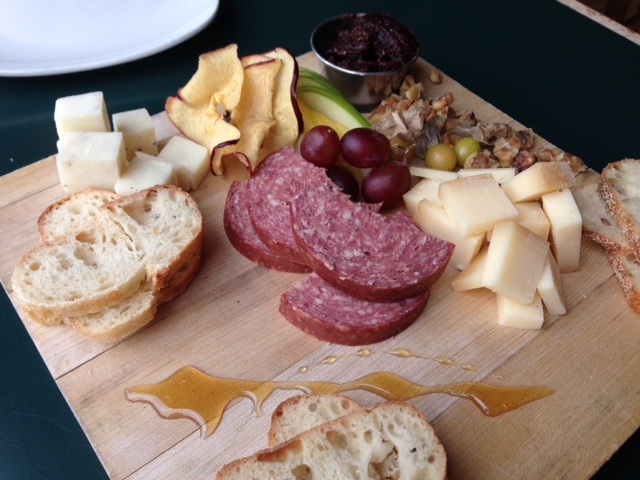 We started with the ploughman’s platter, which is a cheese board with interesting pairings. The platter comes with two types of cheese (I’m assuming they change because they were written on a chalk board). We got an aged cheddar and a truffled goat cheese. The aged cheddar was bold and nutty and perfect for a cheese board. I usually don’t like goat cheese, but this one was actually pretty good (although it did come out with some mold on it…we weren’t sure if that was a cheese thing or not so we just cut off the really moldy parts). The platter also came with some Bavaria sausage, honey, bread, housemade jam, grapes, sliced apple and pear, walnuts and mini tomatoes. It was beautifully presented and most of the ingredients were top-notch (I am still hung up on the mold that was on our goat cheese). Even though it was a great starter to our meal it was a bit on the expensive side for the price. I’m not sure I would want the platter to be any bigger, but I think the price should be less. 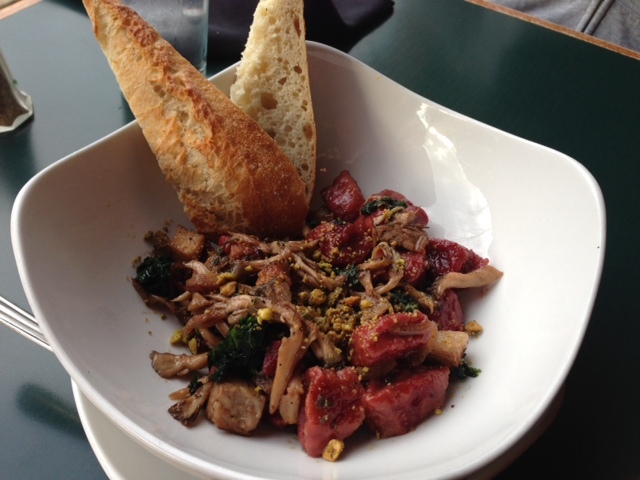 My mom got the special, which was housemade beet gnocchi with kale, hen of the woods mushrooms and pork belly. The gnocchi was denser and larger than the average gnocchi, but because it wasn’t in a heavy sauce they worked. 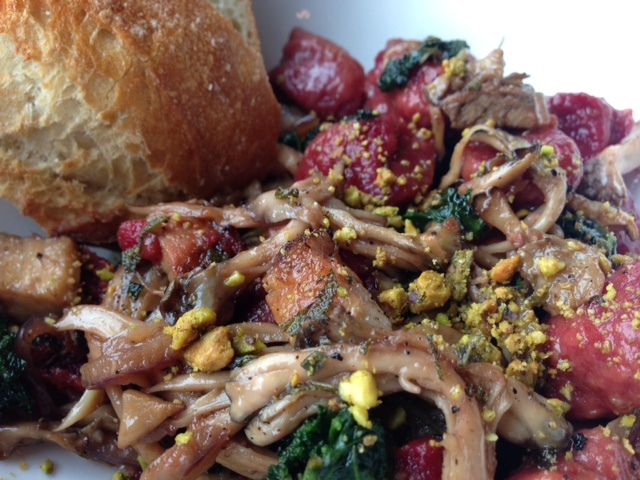 The mushrooms and kale went really well with the earthiness of the beet flavor, and the pork belly added a much-needed saltiness to the simpler ingredients. There was a light sauce, probably mostly olive oil, that kept the dish from becoming too heavy. If there had been a creamy sauce on top it would have overwhelmed the great flavors of the simple ingredients. 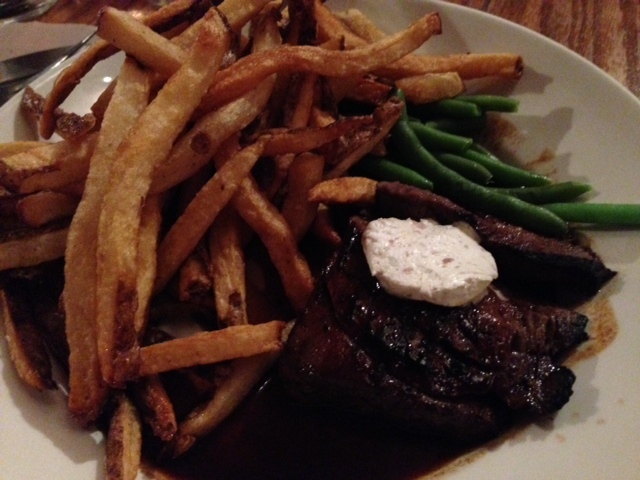 I got the steak and frites because again, I always judge the quality of a restaurant by their steak and french fries. My steak was perfectly cooked with a great sear on the outside. It was seasoned very well, and had a little something extra that tasted like more than just salt and pepper. I love a traditional steak browned with just salt and pepper as seasoning, but this had a little additional kick of flavor that I couldn’t ID — but it was great! The sauteed spinach and kale under the steak was way too salty and tasted like it was a forgotten side. Greens can be really great when paid a little bit of attention, but these were overcooked and so salty that they were inedible alone (I took them home and sauteed them up with some egg whites for breakfast the next day…the extra salt worked well when balanced with the bland egg whites). I was expecting a small plate of frites to come with my steak, but the massive cone of frites our table neighbors got as an appetizer also arrived with my entree. The cone of frites is definitely enough for two people. They were salted perfectly and had a great crunch. 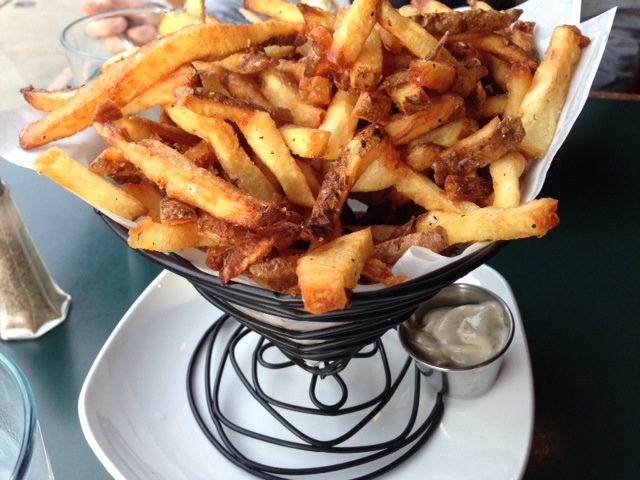 I’ve said for a while that my favorite fries in Madison were at Brasserie V, but the frites at Jacs were equally as crave-worthy. But the aioli at Jacs was more unique than Brasserie V. It was zesty…almost as if it was a citrus garlic aioli or another similar flavor combination. It took me by surprise at first, but the flavor combo balanced the greasiness of the frites well. 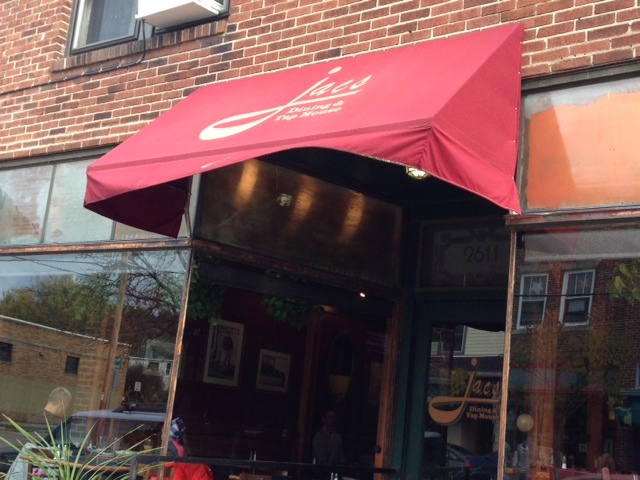 FOOD NOTES: Jacs can definitely give its Monroe Street competition, Brasserie V, a run for its money. 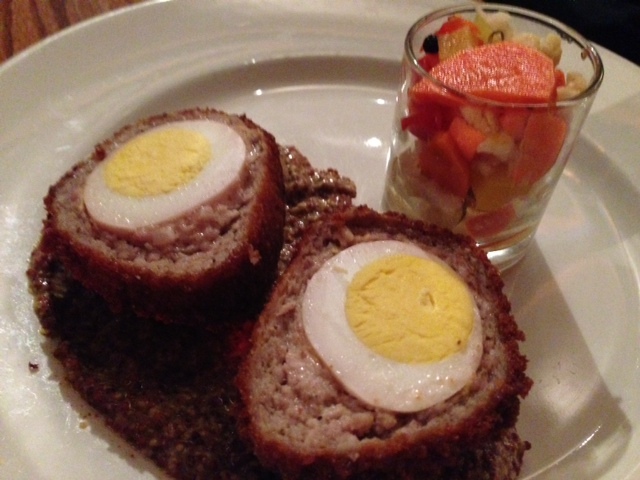 Both seem to focus on European flavors and dishes, and both do it very well. The cheese platter we got was very well done (aside from the questionable mold), and had some interesting pairings I hadn’t seen on a cheese platter before. The housemade beet gnocchi was something special on its own, and was elevated by the other simple, ut perfectly done ingredients. My steak and frites were basically as good as steak and frites could get, but I expected more from Jacs on the sauteed greens. The biggest negative that sticks out to me is Jacs’ prices. Even though Jacs’ food is very close to the quality of restaurants around the Capitol Square, the restaurant isn’t around the Square so the prices need to be a little lower.